This push-button system, also known as Knipper®, is particularly safe and gentle on the fabric due to its nature. The fivefold teeth anchor themselves in the fabric without damaging it. ACTIVO PROTECT-S is particularly suitable for stretchy and/or lighter fabrics. The flat appearance, the low weight and the supple closure offer active possibilities. Depending on the application, the individual system components can be combined in different ways. when the stud is inserted. Additional information ATTENTION: After washing, REGREASING is absolutely necessary, for instance by means of a fabric softener. Otherwise, the powerful degreasing process during the industrial washing can lead to greatly increased opening values through to complete failure of the fastening system. 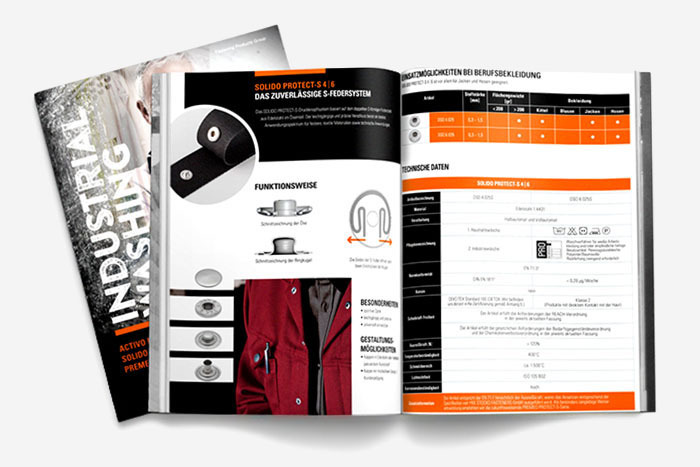 To optimise and extend the durability of the fastening properties, we recommend closing fasteners during industrial washing, and always using rehydrating additives or, alternatively, the form-stable and durable press stud system PREMEO PROTECT-S 3. The design of your garment is crucial to the correct selection of the appropriate ACTIVO system. The permissible fabric thickness depends on the number of layers of fabric on top of each other and their fabric properties at the attachment position. The fabric thickness is measured using a special micrometer. We are happy to support you in this. Please contact us and send us a sample of the corresponding textile. The attachment positions of the ACTIVO system on the garment should be chosen in such a way that uneven layers of fabric are avoided. The cuff widths (including seams) should be designed so that the selected press stud design has sufficient space for a secure connection and seams are avoided. For multiple fabric layers, it is recommended to attach seams next to the attached ACTIVO push button. This prevents the superimposed layers of fabric from shifting when subjected to lateral stress.